Oct 16 POTS in Art? I found it! Ever since I saw Dr. Grubb last April, I have been searching for this painting. 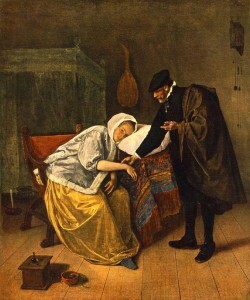 Dr. Grubb had showed me this painting to illustrate how he believes this patient could be a patient with EDS type 3 and POTS. This painting is from the Dutch realism period, and was painted by Jan Steen in the 1600’s. The Dutch Realism period was a period when artists began to paint real life…even sick people. This survey has been circulating around FB and the Blogosphere…So in honor of promoting Invisible Illness Awareness I, too, am jumping on the bandwagon. 1. The illnesses I live with are: Dysautonomia/POTS (Postural Orthostatic Tachycardia Syndrome) and Ehlers-Danlos Syndrome, Type 2/3. As you can see, I did not write the piece below. I wanted to post it though, because I find it to be a brilliant description of learning to live life with a chronic illness. Each time I read the following piece, I think about my specialists (especially Dr. Grubb and Dr. Lavallee) who are encouraging me to tame my gorilla.